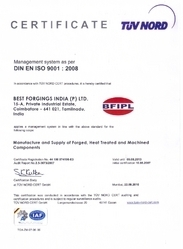 We Best Forgings India Private Limited are an ISO 9001:2008 certified company, a leading manufacturer, exporter and supplier of premium quality Ferrous and Non Ferrous Forged Components. Range of products offered by us is Forged Parts, Forged Pipe Fittings, Forged Valves, Automobile Components, Flanges, Non-Ferrous Components, Electrical parts, Agriculture Parts and Machined Components. We are guided by our visionary and highly experienced mentor Mr. A. Mahalingam on the tracks of success in the industry. In four years of our establishment, we have been able to craft a niche for ourselves and design norms of operating and meeting demands of our clients. Having expertise in designing, engineering and manufacturing products of high quality to meet demands of industry, we use premium quality raw materials sourced form trusted vendors. We source our raw materials from vendors like VISL, VSP, RL Steels and Mukand. Products offered by us are quality tested by our quality experts at each stage of development to stand on international standards. Supported by the team of professionally trained and highly qualified people who are dedicated and self motivated, we are able to meet requirements of our clients and industries. People working with us come from diversified backgrounds and work together to achieve a single goal of meeting highest level of client’s satisfaction and being market leaders. Every one working with us are expert in their field and work in units to maintain work flow. Our state-of-the-art infrastructure and latest machinery installed in manufacturing unit is our greatest strength. For safe storage of products manufactured by us, we manage an evenly segregated warehouse near our factory area. This distribution helps us in identifying the products easily at time of delivery for bulk demands of our clients. We also offer customized solutions of our products at specific demands of our clients. Products offered by us are designed flawlessly by our experts and are prepared under their inspection to meet actual demand of clients. Our products are available at industry leading prices and are appreciated for their functional efficiency, long life, durability and reliability. We are backed with all the facilities that are required to manufacture a technologically advanced range of Ferrous and Non Ferrous Forged Components. It is our solemn aim to fulfill the objectives of the company. We are engaged in manufacturing quality range of Ferrous and Non Ferrous Forged Components. Our range is developed using quality raw material such as alloy steel and carbon steel. These raw materials are obtained from trustworthy source like VSP, VISL, Mukand and RL Steels. Used to fulfill the needs of engineering, automobile, defence and pump industry. In addition to manufacturing the above mentioned products, we hold expertise in providing services for heat treatment and CNC machining to attain 100% customer satisfaction. An experienced and well qualified team of professionals are available with us to support during all pros and cons. People working with us believe in offering our clients with satisfactory products those are manufactured using premium quality raw materials. To ensure proper and smooth functioning of our company and processes of production, we have segregated our complete team into departments. Our employees are engaged in offering high quality customized solution of our products. We are a leading manufacturer and exporter of premium quality ferrous and non ferrous forged components. Products offered by us are acclaimed for their quality, efficient functionality, durability and reliability. Our products are brought into application in Automobile Industry and Engineering firms. We are one of the leading manufacturers of Ferrous and Non Ferrous Forged Components in India. Our products are acclaimed in national and international market for their user friendly nature and efficiency.